Recognized as a Canadian leader in conditioning and results driven coaching, Tom is a master at helping people from all walks of life achieve massive success in transforming their physiques and achieving optimal health. Utilizing a cutting edge assessment system to determine ones customized program, and the revolutionary exercise conditioning system, FQS MAX RESULTS™ for rapid fat loss and effective muscle toning, Tom is referred to as the fitness and health’s “Secret Weapon”, by CJ Calvert, in this book “Living an Exceptional Life”. 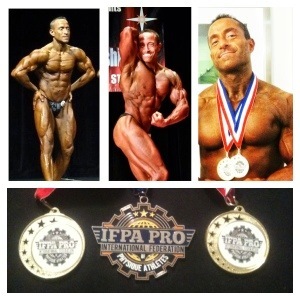 Competitively, Tom a top 5 Natural World Championship Middleweight Bodybuilder, he is the 2008 Mr. Natural Canada, as well as a former Canadian Natural National Champion, Southwestern Canada Natural Champion, Natural Pro Bodybuilder with the IFPA/WNBF/DFAC and Natural Team Canada Captain. A professional teacher, Tom applies his skills with the York Region District School Board as well as entrepreneurially, writing books and articles on the topics of health and fitness over the past two decades. In his spare time, Tom loves travel, movies, reading, athletics including cycling, soccer, tennis and mixed martial arts, and a great BBQ. A snapshot of Tom from a different perspective. Nutrition: 5 meals per day, 250g + of protein, 150-250g of carbs, and healthy fats. Worst Body Part to Train: Legs. No matter how you slice it, when you have weaker legs, it takes that much for diligence and hard work to make them grow. Favourite Training Day: Chest, Shoulders, Triceps. The pump in those areas makes me look very big. Best Bodybuilder in the World: Tom Kiat! Best Competition Moment: Winning the Natural Southwestern Canada in 2007 in front of my family and friends; a big crowd of supporters who were wearing t-shirts they made of me. A cool atmosphere with plenty of friends made backstage. Worst Competition Moment: Losing sight of whats most important; personal improvement and development of character through trials and tribulations over winning. Most Embarrasing Moment: Walking on stage with a mouthful of rice cake. Why Natural Bodybuilding? I have always taken a strong stance against drugs. Performance enhancing drugs are unhealthy and lead to a temporary appearance. I prefer long term through intelligence, guts and your own genetic gifts. Thoughts on Pro Bodybuilding? I am not keen on pro athletes’ decisions to take performance enhancing drugs. However, I have learned not to get caught up in judgement of others. I have chosen a drug free route and I’m proud to say that I am clean and have been thoroughly tested. Drug users can live with their own choices and the benefits and consequences those choices carry. Regardless, sometimes we need to look at the common ground we share with each other. Pro bodybuilders are regular people who share a love for the sport, and an outstanding work ethic. What motivated you to start training? I started at 16 yrs old, buying my York Barbell set and working out on my birthday for the very first time in 1986. I wanted to look like some of the athletes who were performing at a high level in pro sports. Why do you compete? Competing is a measuring stick for my performance from point A to point B. A competition is the accountability factor that forces you to attain your peak shape so that you can measure that progress. At my age, there is not anything I really want to acheive in bodybuilding anymore other than to maximize my potential and show others that it is possible. I also like the comraderie backstage. We are competing alongside each other. We let the judges decide the rest. Other than that, if the competition location is cool, and I can make a good trip out of it, I would consider. A competition in Southern California or Vegas in the next bit is an idea. Right now, I am having a lot of fun progressing. My best progress in over twenty years has me excited. Favourite TV Show: Sons of Anarchy, 24, Dexter. Current Song Favourites: Anything with a heavy beat. Hip Hop is what I listen to the most though. Vacations Planned: Las Vegas, Motorcycle Road Trip with the EG Bikers. Favourite Way to Relax: Hot tub, long ride on my motorcycle,movie by the fireplace. Biggest Pet Peeve: Two faced people and people who are superficial and materialistic.